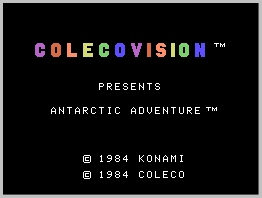 ColecoVision.dk presents: Antarctic Adventure © 1984 by: Konami Industry Co., Ltd.
ColecoVision Game Programmed by: Konami, Coleco Inc.
ColecoVision GFX Programmed by: Konami, Coleco Inc.
ColecoVision Cartridge #, Casing and Producent: CC 242901 / 4L 4516, Standard Black U.S. or European CBS Style, Coleco Inc.
Use your ColecoVision controller or your Super Action controllers. Explore the icy Antarctic as you speed around the South Pole with an intrepid penguin explorer. 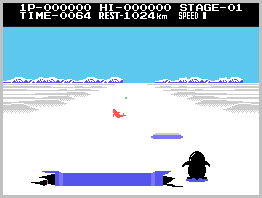 Race against time as you try to raise flags og many nations at Antarctic icestations. Leap ice crevasses, hop over ice puddies and dodge playful, curious seals on your exciting journey. Capturing a flag, 500 points. Catching a fish, 300 points. Jumping over an obstacle, 30 points. 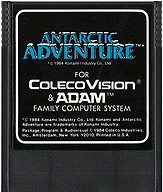 High Score For The ColecoVision Version Of: Antarctic Adventure. 1st XScore: 219.030 - January 06, 2005. 1st XScore: 548.720 - January 01, 2018. 1st XScore: 25.450 - August 06, 2010. 2nd XScore: 100.390 - March 03, 2004. 2nd XScore: 470.270 - December 18, 2010. 2nd XScore: 22.950 - October 16, 2010. 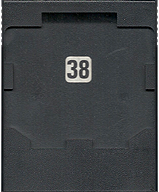 3rd XScore: 55.140 - August 28, 2001. 3rd XScore: 371.580 - December 26, 2010. 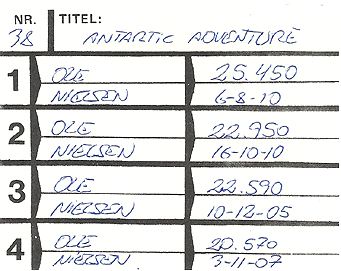 3rd XScore: 22.590 - December 10, 2005. 4th XScore: 51.860 - June 1, 2004. 4th XScore: 303.300 - July 24, 2016. 4th XScore: 20.570 - November 03, 2007. 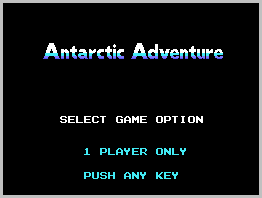 ColecoVision.dk Game # 38, Antarctic Adventure is last updated: March 22, 2019.